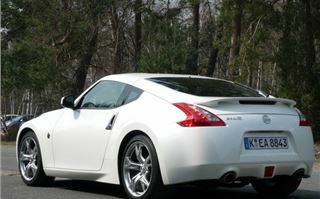 In the pre-brifing to testing the Nissan 370Z coupe I learned a fact I'd been unaware of. I had always thought that the Mazda MX-5 was the World’s best selling sportscar. But I was wrong. If you start counting at the original 240Z of 1969, Nissan has sold 1,700,000 Z cars to Mazda’s 950,000 MX-5s. Sure they lost their way in the 1980s and went through a lardy stage. Then, as a result of the last recession, we lost official imports of the heavy-duty 280PS 300ZX twin-turbo. 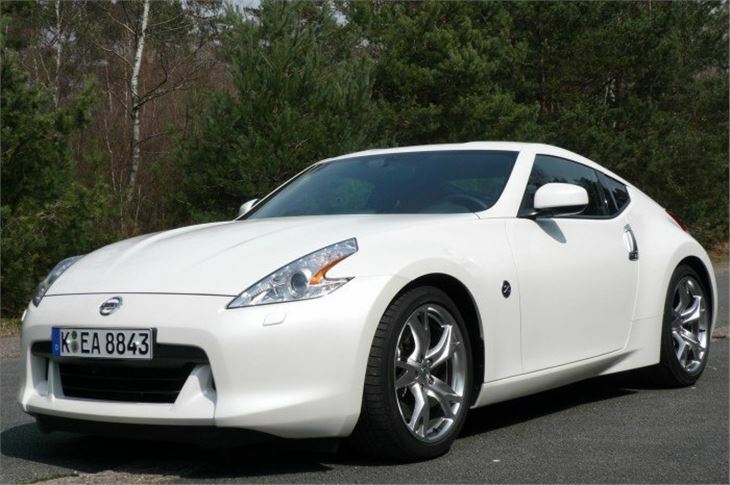 Z cars died completely by the end of the nineties and it wasn’t until 2002 that keen drivers started personally importing the sensational all-new 280PS 350Z. UK demand for that car was so huge that when Nissan put the roadster on sale in October 2005, the entire UK allocation for a year was sold out within minutes. Power hikes then followed, with 300PS from March 2006 and a new 310PS engine from May 2007. These are real hairy-chested sportscars, in the same league as a Porsche Cayman but with different driving characteristics. Front mid engined and rear drive, they are beautifully balanced so even an average drive like me can have a lot of fun with them without getting into trouble. And that’s with the ESP switch off. In a race, a Boxster or Cayman driver would probably win, but the one in the 350Z would have the biggest grin. Now, for the fifth generation, Nissan has completely redesigned its Z car. 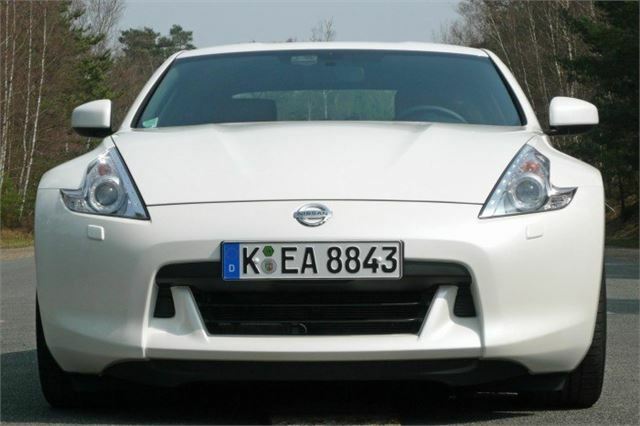 The Nissan 370Z looks very similar, but it isn’t. It’s 50mm shorter, 30mm wider, the front and rear wheels are 100mm closer together and the structure is 30% stiffer. There are new arrow shaped headlights, boomerang shaped tail lights, lighter suspension, scratchproof paint, bigger brakes and innovative variable braking that gives good low speed response as well as excellent braking from high speeds. Using electric motor powered variable valve timing and valve lift, engine power of the 3,696 cc V6 is up to 331PS at 7,000rpm and torque to 366Nm. The 6-speed manual has a device called synchro rev control that balances the revs on upshifts and downshifts better than you can. And, for the first time in the UK, there’s an automatic. This could have been a total disaster, simply pandering to lazy drivers who want to look good and destroying the character of the car. But it isn’t. Nissan has come up with a 7-speed torque converter box with lock-up and downshift rev matching. In town you just leave it to get on with the job, but out on the open road you can use a pair of magnesium paddleshifters to give it large, and they work beautifully. Easily as well as a Jaguar XK’s, though the gear number indicator in the central rev counter is much smaller. 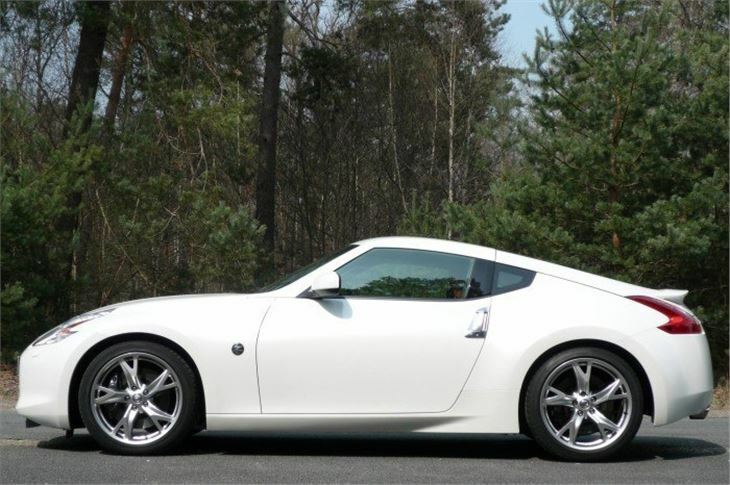 There are two wheel options for the Nissan 370Z: 18” standard or 19” GT pack. Both our test cars were on 245/40 fronts and 275/35 rears on 19” Rays alloys, yet, surprisingly, the ride quality was anything but bone jarring. You’d have to watch those rims on low kerbs, crumbling speed cushions and potholes but at least they don’t scramble your internal organs like they can on all too many full-on sportscars. 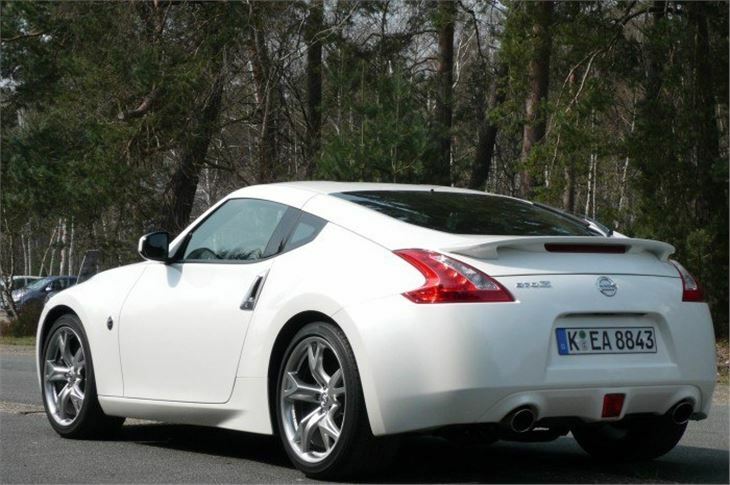 The stiffer body structure of the 370Z has allowed Nissan to do away with the rear strut top bar, improving capacity for golf clubs and trolleys, which seems to be an essential feature of sports cars these days so that owners can show off their latest status symbol to their mates. And Nissan has just announced a 370Z Roadster, coming in late summer 2009. Prices are sensible. Only very slightly up on the 350Z and well below a Cayman or Boxster. Emissions are down one full band, so the extra first year tax from April 2010 is £750 rather than £950, though annual tax is only £10 less. Commendably, you can also expect a few more mpg. You can choose perfection and get a Porsche Cayman, go girly and get an Mercedes SLK or go for grunt and get a Nissan 370Z. Not the most eco friendly thing to do, but when was eco friendly ever fun?